I just finished my review of the newest Rory Gallagher DVD (Eagle Vision) for PiercingMetal. It’s called “Ghost Blues” and is a documentary on Gallagher’s life, including a bonus disc loaded with live performances from Beat Club in the early 1970’s. I love it. You can read why here. Writing this review brought back memories of seeing Rory do his thing at The Bottom Line Club back in February 1976. That was an amazing night in a small 450 seat venue and a blistering performance. I remember he came out and plugged into a small amp that was simply propped on one of the club’s even then decrepit wooden chairs. I remember the incredible runs of false harmonics he plucked and a performance of my favorite acoustic number “Out On The Western Plain”. I also vividly remember that Roger Taylor, John Deacon and Brian May of Queen were in attendance and my friend Bill and I actually managed the bravado to go up and get handshakes and autographs. 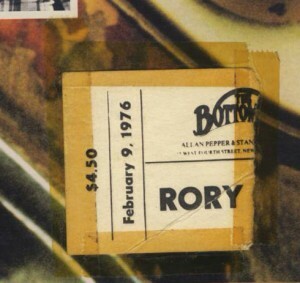 Rory was supporting his Against the Grain album that tour and I still have the ticket taped to the back of the LP. $4.50 for a night of rock n roll nirvana.